Improve the smart remote control operation and update menu items and settings. During smart remote control operation, you can switch to copy mode/remote control mode by smartphone operation. [SEND] is deleted. You can connect the camera through Wi-Fi only in shooting mode. The default setting of [A.OFF] (Auto Power Off) is changed to [60sec] from [10sec]. 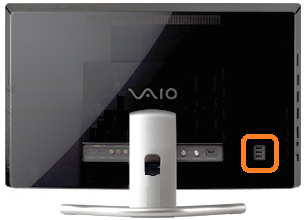 The default setting of [RMOTE] (Remote) is changed to [ON] from [OFF]. 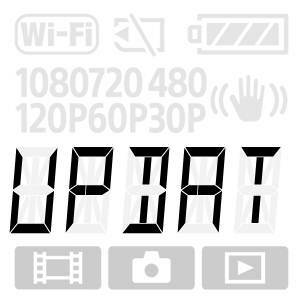 Note: Update "PlayMemories Mobile" to the latest version (Ver. 3.00 or later), before you start the smart remote control function. 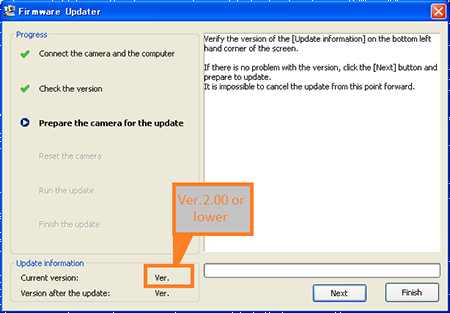 The following benefits and improvements by the previous upgrade program (Ver.2.00) are included in version 3.00. Both Rec and Setting Sound on. Rec sound on, setting sound off. Both Rec and setting sound off. View the Operating Guide to know how to use these functions. When performing the firmware update, please use a fully charged rechargeable battery pack NP-BX1 or NP-FG1. The download of the [Update_CAMAS15V300.exe] file will start. 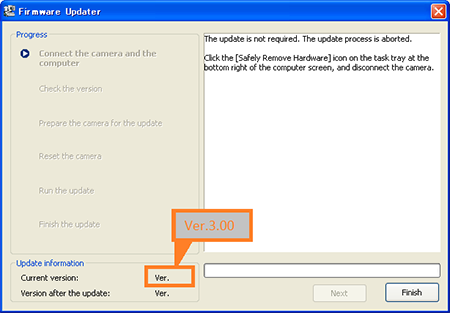 Once the file has downloaded successfully, you're ready to install the Firmware update Ver.3.00 for HDR-AS15. Double-click the [Update_CAMAS15V300.exe] file you downloaded to start up the Firmware Updater. Press the NEXT button to display [PLAY]. If [PLAY] appears then the firmware version is Ver.3.00.